5. I entered my password (without error) and "Enter"
6. Then nothing happens. The buttons "Cancel" and "Authenticate" are enabled but does nothing. 7. If I close the popup by clicking on the close icon then the installation starts. if people experiencing the problem can install those and test that would be great. reproduce. In order to strace it properly you will temporarily make strace setuid. Same problem after a fresh installation of Wubi maverick-desktop-i386 without network. If I wait a few minutes, a dialog appears saying "org.freedesktop.DBus.Error.NoReply: Message did not receive a reply (timeout by message bus)"
Ok, that strace was useful, thanks. 5362 is the helper process that talks to PAM, and 5307 is the supervisor process. So the PAM process works fine, and the helper tells the supervisor that it worked. And that's the last we ever hear from the supervisor in that strace. as the origin of the problem. * If the child exits, it removes the watch on stdout, and does not a lot else. The situation is worse with the fix (0.9662ubuntu1.1) The authentication is systematically refused, at third try, the authentication dialog is closed, and the installation starts. I confirm that the latest version of policykit in James's PPAS fixes the issue and I'm unable to reproduce the original behaviour. James can you SRU your fix to Maverick ? I think it's worth SRUing it to lucid too. I don't know if it's another bug or not, but i've got an error with the same symptoms as described here, but an error dialogs shows afterward that `polkit-gnome-authentication-agent-1` crashed. That would explained that the authentication success is not forwarded to the update manager, while authentication was successful and update works perfectly when closing the authenticate window. The bug might be related to policykit-1-gnome. Well, maybe the fix was committed, but at least it has not reached my Maverick 10.10 64bit yet. If I try to update the policykit-1 through apt, I am informed that the newest version is alread installed, but the installed version is policykit-1 (0.96-2ubuntu1). So I am still struggeling with the same problem. I was actually going to post the same comment about it not being fixed in Maverick. I have however found a PPA that has an updated policykit for Maverick (policykit-1 0.96-2ubuntu1.2) from reading the comments on #445303. I am have only just installed it but seems to fix the issue. I find this bug is no longer relevant to me. Excellent hint - this updated version of policykit solved my problem. Thanks for that. Contrary to John, this bug was relevant for me after updating from 10.04 to 10.10. Thanks Cas for poiting out the ppa with polkit update (#14), works perfectly here. Hum, i retract my comment, the bug is less systematic, but still occurs. In a fresh WUBI-based maverick install, all updates installed, this problem still occurs. james-w's PPA package resolves this problem. Why not add this to maverick's updates? I've been having this issue ever since I upgraded to Maverick. 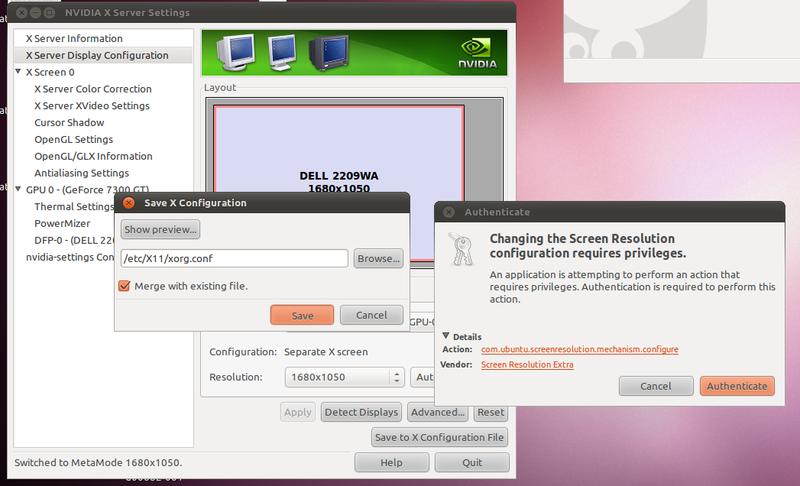 Not only in upgrade-manager, but also when using the nvidia X Server Settings, and trying to 'Save to X configuration file' (see attached screenshot). Is this or is this not the same as the policy kit bug, below? My Maverick desktop picked up this bug /today/.